(PhysOrg.com) -- Anyone who has ever stepped barefoot onto blacktop pavement on a hot sunny day knows the phenomenon very well: Black surfaces absorb the sun's heat very efficiently, producing a toe-scorching surface. In the wintertime, that can be a good thing: A dark roof heats up in the sun and helps reduce your heating bill. But in summertime, it's definitely a bad thing: Your house gets even hotter, and your air conditioning has to work harder. In most places, the summertime penalty is greater than the wintertime gain, it turns out, so that's why many people, including U.S. Secretary of Energy Steven Chu, strongly advocate switching to white roofs. It's no small matter. In fact, Chu says that turning all the world's roofs white would eliminate as much greenhouse gas emissions in 20 years as the whole world produces in a year. But some critics point out that in northern cities, the gain in summer could be outweighed by the loss in winter. The ideal situation, then, would be to get the advantage of white roofs when it's hot and black roofs when it's cold. Now, there may be a way to have both. A team of recent MIT graduates has developed roof tiles that change color based on the temperature. The tiles become white when it's hot, allowing them to reflect away most of the sun's heat. When it's cold they turn black and absorb heat just when it's needed. 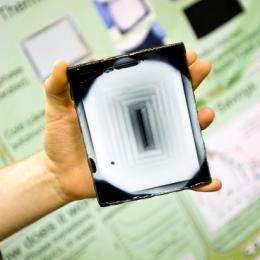 The team's lab measurements show that in their white state, the tiles reflect about 80 percent of the sunlight falling on them, while when black they reflect only about 30 percent. That means in their white state, they could save as much as 20 percent of present cooling costs, according to recent studies. Savings from the black state in winter have yet to be quantified. The team, which the students call Thermeleon (rhymes with chameleon, because of its color-changing property), was one of the competitors in this year's Making and Designing Materials Engineering Contest (MADMEC), a competition for teams of MIT students (or 2009 graduates). Now in its third year, the contest this year was specifically devoted to projects aimed at improving energy efficiency through innovative uses of materials. The final showdown was held Wednesday night, and the Thermeleon team took first place, earning $5,000 in the process. Nick Orf PhD ’09, a member of the Thermeleon team, explains that he and his teammates originally tried to develop a color-shifting roof tile using a system of mixed fluids, one dark and one light, whose density would change with temperature: the dark substance would float to the top when it was cold, and white would float when it was hot. But the system proved too complicated, and instead they hit on a simpler, less expensive method. Now, they use a common commercial polymer (in one version, one that is commonly used in hair gels) in a water solution. That solution is encapsulated — between layers of glass and plastic in their original prototype, and between flexible plastic layers in their latest version — with a dark layer at the back. When the temperature is below a certain level (which they can choose by varying the exact formulation), the polymer stays dissolved, and the black backing shows through, absorbing the sun's heat. But when the temperature climbs, the polymer condenses to form tiny droplets, whose small sizes scatter light and thus produce a white surface, reflecting the sun's heat. They are now working on an even simpler version in which the polymer solution would be micro-encapsulated and the tiny capsules carried in a clear paint material that could be brushed or sprayed onto any existing surface. The tiny capsules would still have the color-changing property, but the surface could easily be applied over an existing black roof, much more inexpensively than installing new roofing material. Although they have not yet made specific plans for forming a business to commercialize their concept, Orf says the team members are determined to pursue the project and develop it into a marketable product. Because the materials are common and inexpensive, team members think the tiles could be manufactured at a price comparable to that of conventional roofing materials — although that won't be known for sure until they determine the exact materials and construction of their final version. The biggest remaining question is over durability, and answering it will require spending some time to do accelerated testing by running the material through repeated hot-cold cycles. Hashem Akbari, leader of the Heat Island Group at Lawrence Berkeley National Laboratory in California, is a long-time advocate of white roofs as an energy-saving measure. He says that some other groups, including a team at the University of Athens, have done research on the use of color-changing materials for roofs, but that in those tests, "the cost and durability has been a serious issue." The Thermeleon team hopes to address those concerns. "It's got to stand up to very harsh conditions," Orf says. "Those sorts of tests would have to be done before we'll know if we have a viable product." In many northern climes, the fact that the tiles turn black in winter will not be of much consequence as our roofs are usually snow covered most of the winter. For those on the threshold, the difference may sometimes prevent the snow from packing in the first place. However, I don't know how significant that might be. On that note, I wonder if a surface (heat aside) could be devised to make snow more likely to melt and perhaps even channel the cold water away. If possible, they could be paired for greatest effect. On another note, in certain climates, maybe it could be best to accept that the snow's going to pack up.. though I'm not clever enough to see how that could be a good thing aside from peace of mind. with new construction the roof "r" values are very high; meaning that the heat gain, summer, and heat loss, winter, are close to insignificant making color changing tiles cost ineffective in Cambridge. they might look nice on the MIT dome though. I'm confused... Didn't they already invent the "mood" ring. I'm impressed from an problem analysis stand-point. I'd love to see commercially viable, energy efficient roof tops, but seems to me there's got to be a better technology. Now I recall that there are many cities in which most homes have a solar hot water heater on the roof. With this (and deatopmg's comment) in mind, doesn't it seem a bit silly to go through a bunch of effort to deflect energy back to the sky during precisely the periods of time in which the energy is most abundant? Doesn't it make more sense to harness the energy for some useful purpose (and if necessary, place some relatively simple insulation underneath)? Solar water heating is perhaps one of the simplest and most efficient uses.. but it could also be used to produce an electrical current (ie. to power air conditioning). Of course, this is still ongoing research rather than just invention.. and if it gets developed far enough, I'm certain there are enough good uses for it for it to be worthwhile. Great idea for new house builds where they can use these instead of loft insulation but I can't see current homeowners being too keen on replacing thier tiles aswell as ripping out that insulation. This is a great idea but another company has already thought of it. You can find them at movingcolor.net.